Update: the photographer who took the image I referred to has agreed to me showing it in the blog. So here it is! 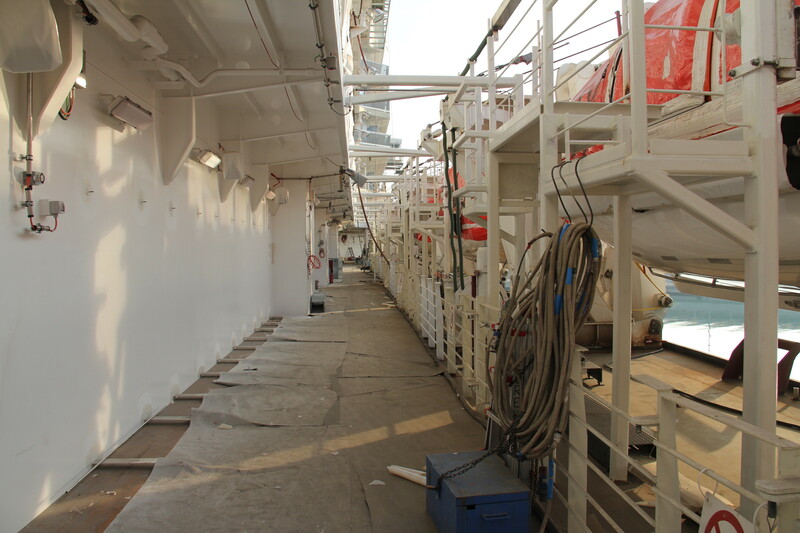 – and you can see that, while there is indeed a promenade deck (which does probably wrap-round), it’s hardly a traditional one. So HAL aren’t lying when they say there will be one, but the views from it will be quite restricted. Please note that the picture is © Cees Kloppenburg and is used here with his permission. I did a post a few weeks ago lamenting the end of the traditional promenade deck, and focusing on HAL’s forthcoming new ship, Koningsdam, as an example. It seems to me that this would be another ship on which the lifeboats would obstruct the view from the promenade deck, in a similar fashion to the Solstice class (Celebrity) and the Royal Princess class. However, I received a comment from Karl in which he pointed out that HAL were saying “A nautical tradition, our teak Promenade deck encircles the ship, offering spectacular views in every direction”; which rather blew my theory out of the water. Here’s a link to their page. I’ve done some more digging and I have found some evidence that all will not be as HAL suggest. Thanks to a link on Cruise Critic I found a set of images taken by a photographer who got the chance to visit Koningsdam in the shipyard. One of the images he took is of the Promenade Deck, and it clearly shows the lifeboats down at deck level with lots of other equipment and rails surrounding them, all of which will obviously obscure the view out to sea. Here’s a link to the whole set of images; the one I’m thinking of is about 2/3 of the way down the set. I’ve asked the photographer if I can use the actual image directly, and I’m still awaiting a reply. Hopefully he’ll agree. Happy New Year Tom. I think the views offered form the prom decks on older ships was just a coincidence of the design. Modern ships are locating the life boats right on the prom for easy boarding and generally not obstructing cabin views. I think that you are right – it’s the end of the prom deck, especially on big ships. They might call it a prom deck but it is certainly not a prom deck as we all know it. I guess the “spectacular views in every direction” are views of the lifeboats! How disappointing. Thanks for investigating this more.